Guillermo del Toro’s The Shape of Water is a spellbinding love story for the ages. A soulful fairy tale interspecies romance, The Shape of Water will be the film that defines del Toro’s work. It’s gorgeous and weird, heart-wrenching and utterly unforgettable. Who knew a twisted love story between a cleaning woman and an amphibious creature set during the Cold War would be one of 2017’s most stirring films? 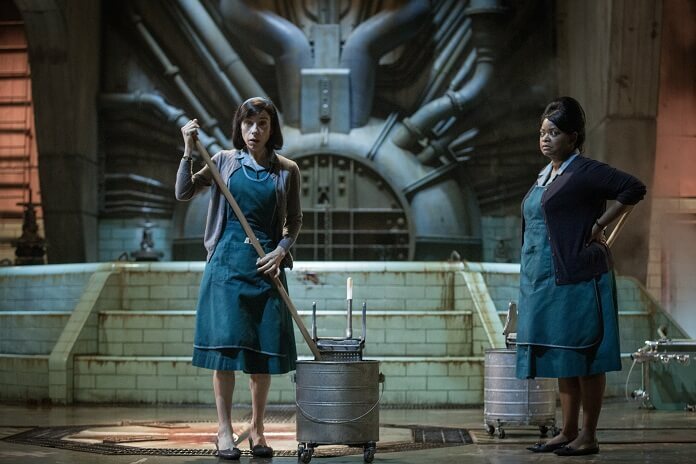 Sally Hawkins is simply brilliant as Elisa, a mute young woman with a troubled past who works as part of the janitorial staff at a secret government facility. She lives a simple life in her apartment above an old-time movie theater, spending her free time with her gay artist neighbor, Giles (Richard Jenkins), and showing up always a minute or two late for work. Elisa’s inability to speak is in sharp contrast to the talkative Giles and to her best friend at work, Zelda (Octavia Spencer). Zelda keeps up a running dialogue about her lazy husband, yet she’s sensitive to Elisa’s moods and always watches out for co-worker/friend. Elisa’s daily routine is broken up by the top-secret arrival of an amphibious humanoid that government agent Richard Strickland (Michael Shannon) found in the Amazon. The unique creature’s ability to breathe in and out of the water makes him hugely valuable to the U.S. space program. Those qualities also make him the target of Russian spy Dr. Robert Hoffstetler (Michael Stuhlbarg) who’s infiltrated the secret facility. Elisa is completely taken at first sight with this exquisite creature (played by Doug Jones) who is, like her, different from the accepted norm. Richard uses cattle prods and torture to communicate with the creature, yet it’s Elisa gentleness and offers of hardboiled eggs that break through to the aquatic being. The merman and Elisa form an immediate bond and when it becomes apparent this intelligent, otherworldly being is going to be experimented on or killed, Elisa seeks the help of an unlikely ally to break him out of the facility. As their relationship grows, Elisa and the merman gain strength from each other’s presence. This forbidden love transforms both the mute young woman and her secret house guest, ultimately pushing them into a showdown against government forces that fail to understand the potential of this amazing creature. Sally Hawkins delivers a stunning performance as the silent Elisa, communicating via her expressive eyes and sign language. Hawkins doesn’t need to speak to make the audience understand every ounce of emotion she’s feeling. It’s a lovely, nuanced performance that takes Elisa from someone who loves her orderly life to a more free-spirited, determined woman willing to sacrifice herself for the creature she believes is her soulmate. Michael Shannon sinks his teeth into his role of a single-minded, cruel government agent bent on destroying the unique life form because it’s a threat to his view of the world. Unlike Shannon’s character’s black and white worldview, Michael Stuhlbarg’s Dr. Robert Hoffstetler can grasp the necessity for grey areas. Describing him as a spy with a heart sounds cliché, but its appropriate in this case as he’s humane where Strickland’s gleefully sadistic. Richard Jenkins is sublime as Elisa’s neighbor and confidant, an artist who refuses to acknowledge time is marching forward and has left him behind. Octavia Spencer, who deserves more screen time, delivers another outstanding performance as Elisa’s sounding board and loyal friend. Guillermo del Toro’s films are always visually stunning, but The Shape of Water is in a class by itself. 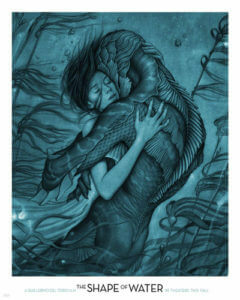 The ocean heavily influences del Toro’s color palette, with greens and blues flooding each frame lest the viewer forget the importance of water to the film’s striking leading sea creature/man. The set design and lighting assist in creating this magical watery world in which it’s possible to believe fairy tales can have happy endings and love can conquer all. The Shape of Water defies convention and never settles for the ordinary path in telling an extraordinary romantic tale.